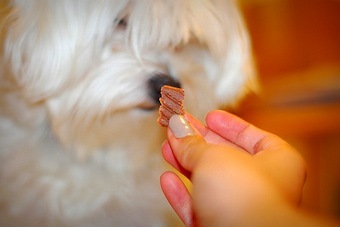 Dog training treats are one of the first things that people tend to picture when thinking about dog training. In all-positive training, especially, treats are a huge part of the process. And while I don't agree with using treats all the time, balanced trainers like me do use the occasional treat as well! Instead of using an excessive amount of treats for training and then trying to wean your puppy or adult dog off the treats to listen, consider the balanced training method. I use 95% verbal and physical praise, and only 5% treat praise for training. This produces a dog who is eager and willing to listen to you regardless of whether you have a tasty treat in your hand or not. How does this approximate ratio of praise work in actual training? Well, take sitting at heel position for example. When first teaching a dog to sit in heel position at my left side, I will use a little treat for praise about every 10th sit. The other times, my dog will get verbal praise and/or a scratch under the chin or petting. That being said, there are certain commands that are an exception to the rule... the recall is one of them! Teaching a dog to come reliably is one of the hardest commands to master, and takes ALOT of training and practice. I've found that you will get the best recalls (no matter what kind of distraction) if you use a one treat to every three recalls ratio. There's a treat involved often enough that your dog will come when called each time, without him becoming reliant on seeing a treat to obey! So what kind of treats are the best for training a dog? One that is soft and stinky! A crunchy biscuit is not really going to cut it for training purposes... your dog will be sniffing the ground for a while to vacuum up all the crumbs, and they don't smell as good as a soft treat. On the other hand, a nice soft, smelly treat is going to work well as a lure when needed (for example, to teach the down command). It's easy for your dog to chew, and won't drop crumbs all over the training area. Another point I should make is that your dog training treats need to be special! He'll be much more interested in working for something that is new and exciting, than for his kibble. True, some dogs will do anything for a piece of dry kibble, but they're the exception, not the norm. A dog training treat doesn't need to be huge! In fact, just a small piece is best - about the size of your pinky finger nail. That's big enough to be nice and smelly, but small enough that you can just pop in his mouth and continue training. If you are using the all-positive method to train your dog, this is even more important. Many of these types of classes will have you going through a whole bag of treats each class otherwise! A little ridiculous, if you ask me... that's a sure way to make your dog sick, fat, and reliant on treats to listen to you. A yummy treat can help with training! The trick about using dog training treats is to have the treat "appear out of nowhere". You don't want your dog to be watching your pocket or hand the entire time, and you also don't want him to know when the treat is coming! So to make it a surprise, you have to avoid holding the treats in a bag - whether it's the treat bag itself or a little plastic sandwich bag from home. I'm not a fan of treat pouches or fanny packs. The whole element of surprise is completely lost when your dog sees you haul treats out of this big, huge pouch clipped to your pants each time. And frankly, you shouldn't need that many treats to train. It's called going over-board, you know? What works best for me is to carry the treats right in my pocket. Yep, crumbs and all. There's no crinkling of a bag to forewarn of a coming treat, no big pouch sitting front and center saying look at me, and no fumbling around with trying to hold all the treats in your hand. And to keep your dog from knowing where the treats are, you can switch up where you put them! First carry them in your front right pants pocket, and next time put them in the left side. Then in your shirt pocket, and then the back pocket of your pants. Get it? Think sneaky. Some people don't understand why this is so important. Basically, I don't want my dog constantly waiting for the next treat and watching my pocket or treat pouch, but instead, watching me. Best Dog Training Treats Out There! My all-time favorite dog training treat is Pupperoni. It is so handy, as they are shaped like pepperette sticks. You stick just grab one or two sticks, shove them in your pocket, and you're good to go! All you have to do is break off a little piece as you need it. Easy, peasy. They help cut down on the amount of crumbs that end up being harbored in your pockets, too. Other great treats to use are Benny Bully dehydrated liver treats, Roll Over or Bil-Jac's. The last two are a nice training size, and really moist. Another brand that I've used is Zuke's. They have great flavours and you can get ones that are called "Mini Naturals" that are, again, a great training size. Grain-free and low calorie options are readily available, too. However, since my dog has switched to a raw dog food diet, I have been using treats quite sparingly as she gets itchy from most of them. Whether it's the protein source or the additives in treats, either way, it puts Justice in a scratching tizzy. I do keep a small bag of ZiwiPeak real meat treats in the freezer, as they are really high quality and have limited ingredients. The venison, for example, contains 95% pure venison, lecithin, chichory inulin, parsley, and mixed tocopherols to naturally preserve them. That's it! Dog training treats are a useful tool. I don't recommend using them as your main training tool, but they definitely have there place in training. Stick with something soft that has a lot of scent to it, and be sure that you're not over-feeding by using small sized treats for training.